I try to avoid reading reviews of books I'm interested in, and even more so if I'm intending to review a title myself. I'm the worst kind of person- very easily swayed in any direction as long as the point is cogently and convincingly made. So I like to avoid reviews, in hope of keeping my own reaction to a text as unadulterated, and truthful, and as mine as possible. 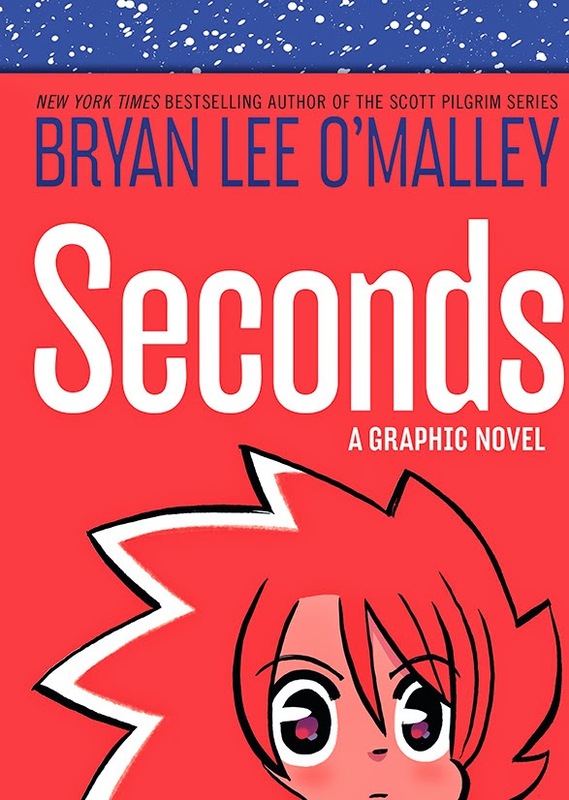 With highly anticipated books by popular authors- it's a little more difficult to exercise- even if you're not actively clicking on links, there are opinions on Twitter, Tumblr, Facebook, headlines that lean one way or another Case in point: Bryan Lee O'Malley's Seconds. 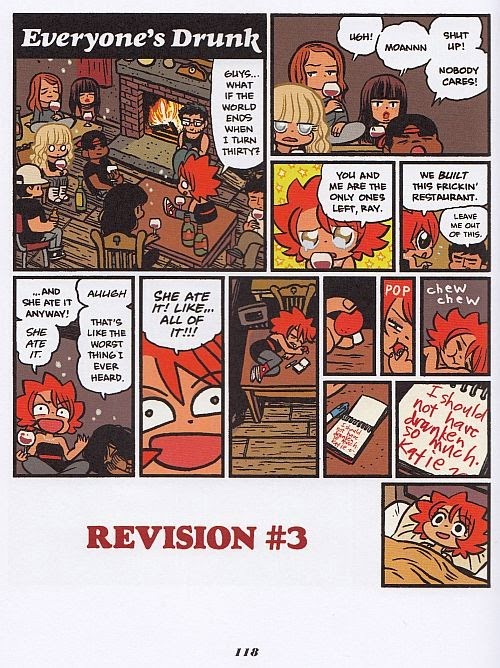 I don't have the fondness for the Scott Pilgrim series many people do, even as I can recognise it as good (perhaps even seminal in terms of impact) piece of work; it's simply a matter of taste, and that, to me, is the essence of objectivity: acknowledging that something works/excels/is poor beyond your personal preferences. Similarly, that doesn't mean texts can't connect with the reader despite their leanings; preferences expand and evolve. The upside with subjectivity is that you can gauge where a person's preferences lie, and absorb their opinions on material accordingly. The word around Seconds had all been overwhelmingly positive, and yet -cartooning aside- it's a book I struggled to find merit in, with a confused, underwhelming narrative that fails to make the points it so clearly wishes to express. Katie's a 29 year-old chef, the owner of Seconds, a successful, well-regarded restaurant, and currently in the process of opening her second eatery. But she's suffering from arrested development- things with the new building aren't progressing as quickly as she'd like, she's separated from her boyfriend after a breakdown in communication about who would be doing what with which business, and she's embarked on an ill-judged, messy entanglement with the new chef at Seconds. On top of all this, her apartment's located above Seconds, where she still acts like the main chef, bossing people around, generally in charge, even though she no longer works there. Skipping down the line some, Katie discovers Seconds is home to a house-spirit, Lis, who directs her in the usage of a magic mushroom that allows the consumer a do-over, erasing any event they wish and providing them with a re-start. 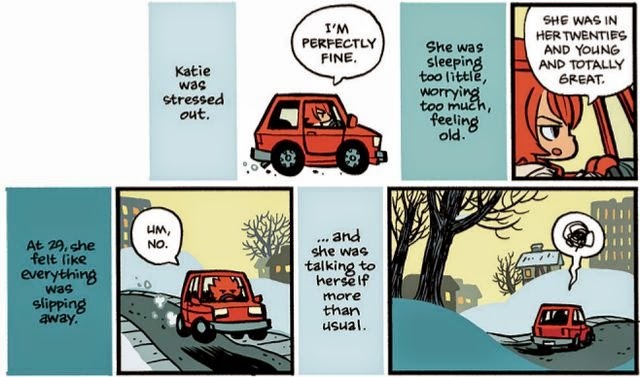 Lis gives Katie one mushroom, to rectify an accident, but Katie avoids her warnings and soon is popping the shrooms like pills and re-writing her life, honing it to the ideal she'd like it to be. It's a widely relate-able premise: even when things are good and going well, or appear so to others, often within yourself you feel an insecurity, an uncertainty- that you should do more, or that things may fall through, about whether you're on the right path. I'd imagine having success young and achieving what you set out to may possibly exacerbate the feeling further; the need to go bigger, the next THING, hitting a plateau, and becoming a little frozen within that mindset. In Katie's situation, some of her youthful ambition and fire has quelled, and facing problems at this moment when things are changing makes her question herself, and then decide to go back and fix things. And this too, is understandable; there are things we would all like to go back and change, predicting a better outcome if only we had done that, or said such-and such, but accepting all the steps and decisions -good and bad- are what have bought us here to where we are today, to the place you're in, to the person you are. It's that ball of schmaltz you know is right, and yet continue to struggle with; life is better than you think/appreciate what you have/live in the now/ what's done is done/you can't change the past. So those are broadly the intended messages Seconds is selling; the lesson Katie is supposed to learn- the idea of getting a do-over and being able to change things to make your life perfect, simply means things would turn out differently, other problems would arise- with Lis acting partly as a sub-conscious. Own the choices you've made and move forward. But it just didn't work for me, partly because O'Malley doesn't follow through. One jarring aspect is the narration. There's an omniscient narration and then you have Katie 'talking to herself' but responding directly to what the omniscient narrator is relating- as if it were her inner thoughts and she's pushing back, which also often breaks the fourth wall. It reads rather like Pushing Daisies, but it's not as effective on paper (perhaps because that show was so sure of it's identity and this feels less so, like it's trying to be various things and not quite hitting any)- it's too much; going for a line between fun and serious, but inhabiting the middle ground uncomfortably, coming across as a forced affectation. But the biggest flaw -and the book's undoing- is O'Malley's treatment of Katie. Specifically where the use of the seconds mushrooms begins to become more and more about getting her boyfriend back, with her happiness and sense of resolution now tied into the achievement of that goal, ignoring the fuller picture of her wishes, and stunting the arc of her personal 'development'- initially presented as something else- of which losing Max was part of the problem, but not THE problem. It doesn't gel with the portrayal of the character readers have thus far been introduced to- which is fundamental because the overtness of what O'Malley's saying and its ability to be effective is dependent on the way in which it is embedded in the story and characters-, and both fail and lose function as a result. Where Seconds does excel is in the cartooning department; from Harbin's lettering to Nathan Fairbairn's colouring is wonderful. Fairbairn in particular does a superb job, imbuing the whole book with appropriate atmosphere and emotion; warmth and chatter in the restaurant scenes, the ominous oranges and yelows he uses to transmute an other-ess as the worlds of the spiritual and begin to meld dangerously. One of the things I really enjoy about O'Malley's books is how he's a dab-hand at giving his characters a personality through their sense of style and fashion- not enough comic artists pay attention to clothing, which is weird because how invested are we in that as a form of identification in reality. It's always a pleasure to look at the outfits he's put together. He and Fischer have stepped up with the backgrounds and detail here: there's a gorgeous splash page in which giant skeletons walk over the burning town and houses below, as grey ash snows down against a pink sky . The new old hotel building is beautifully rendered, the crowded restaurant scenes give a real sense of hustle-bustle. The layouts, too, are good, the incorporation of negative space, and panels falling away as Katie abruptly ends one revision and begins another well done. Whilst I think O'Malley is perhaps a writer I'm unlikely to connect with, Seconds is hugely let-down by a lack of a sure touch, a narrative uncertainty about what it is, and not simply what it would like to be.